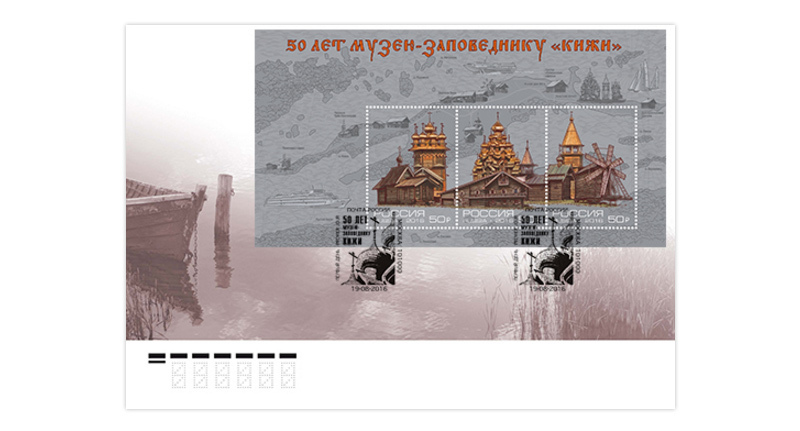 COLLECTORZPEDIA: Russia 2016 - 50th Foundation Anniversary of the State Historical and Ethnographic Museum-Reserve "Kizhi"
Russia 2016 - 50th Foundation Anniversary of the State Historical and Ethnographic Museum-Reserve "Kizhi"
The Kizhi Museum is unique historical, cultural and natural complex, a particularly valuable object of cultural heritage of Russia's peoples. The beginning of the formation dates from the middle of the 20th century, when the territory of the Kizhi Ensemble was declared a state reserve (1945) and restoration work began. In 1951, the first monument – Oshevnev’s house – was brought to Kizhi Island. As an independent institution the Kizhi Open-Air Museum was established in 1966. The basis of the museum's collection is an outstanding monument of Russian wooden architecture – the Kizhi Ensemble, which was included in the UNESCO World Heritage List in 1990. The museum funds consists of over 53 000 exhibits. The collection includes objects of ethnography, archeology, works the Old Russian painting, modern paintings and drawings, manuscripts and printed books, documents and photographs. In general meeting the Kizhi Museum comprehensively reflects the material and spiritual culture of the indigenous peoples of Karelia. 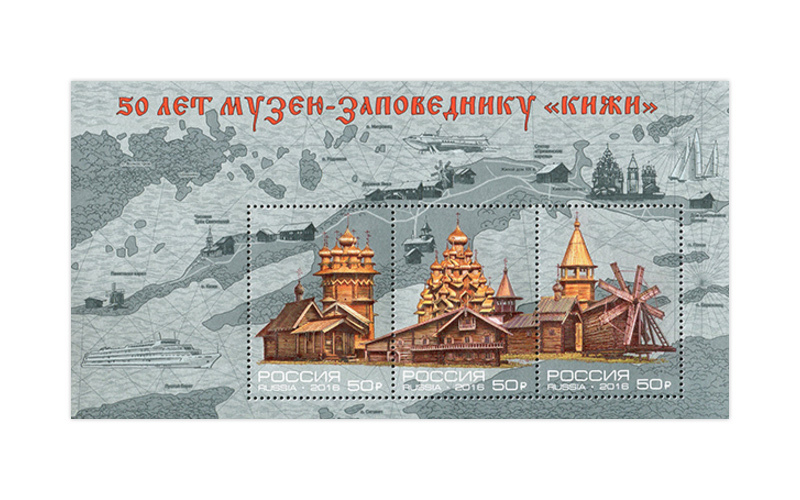 The stamp depicts the Kizhi Ensemble consisting of two churches and the bell tower built in XVIII-XIX centuries, the souvenir sheet margins bear a schematic map of the Kizhi Open-Air Museum.